Opportunities on Edisto for visual artists exist year round. Annually artists are invited to participate in the Fall Art Market, the Spring Art Market, the Juried Jennie Gowan Show, or the Annual Art Walk. In addition to these events hosted by the Edisto Art Guild, many artists and their works can be found each Wednesday at the Bay Creek Arts & Craft Market (during the months of May—October) and quarterly a new artists work is displayed at the Colleton County Library. See below for more details on each of these events. The Fall Art Market is held on the last weekend in October, the same weekend that the Edisto Island Historical Society holds is annual Edisto and Beyond Tour. Shop at this outdoor market located beside the Edistonian, 406 Highway 174 on Edisto Island. Hours: 10:00 AM to 5 PM. 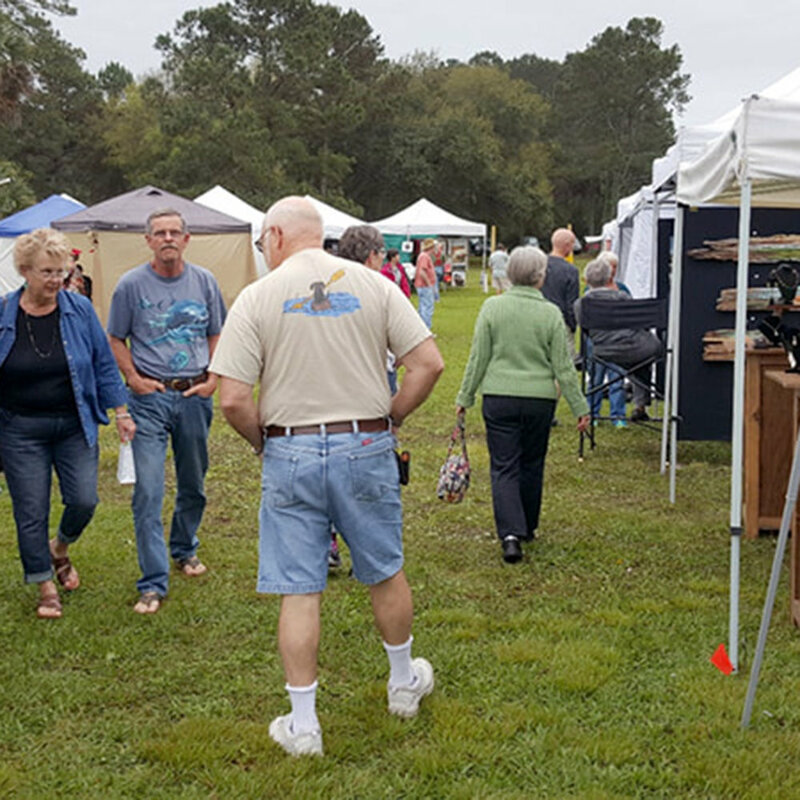 The Spring Art Market, held on the Saturday before Easter, is located outdoors beside the Edistonian, 406 Highway 174 on Edisto Island. Hours: 10:00 AM to 5 PM. Edisto Art Guild sponsors an annual art show each spring for its members. The show includes a variety of mediums which makes it unique as well as interesting. Check the Art Guild Calendar of Events to get the location and date for this special art show! Enjoy an evening reception featuring works by Edisto Art Guild member on the second Monday in September, 6:30 PM, at the Edisto Beach Civic Center, 42 Station Court, Edisto Island. Many local artisans take advantage of the Market at Bay Creek Park, 3706 Dock Site Road, Edisto Beach, to display their arts and crafts. Bay Creek Park Market is open April through October on Wednesdays only from 9:00 AM to 5:00 PM. Visit the park and enjoy the wide variety of arts and crafts for sale. The Edisto Branch of the Colleton County Memorial Library features local artwork throughout the year in the main room of the branch library. Visit the library to see a variety of works by a local artist! 71 Station Court, Edisto Island, SC.